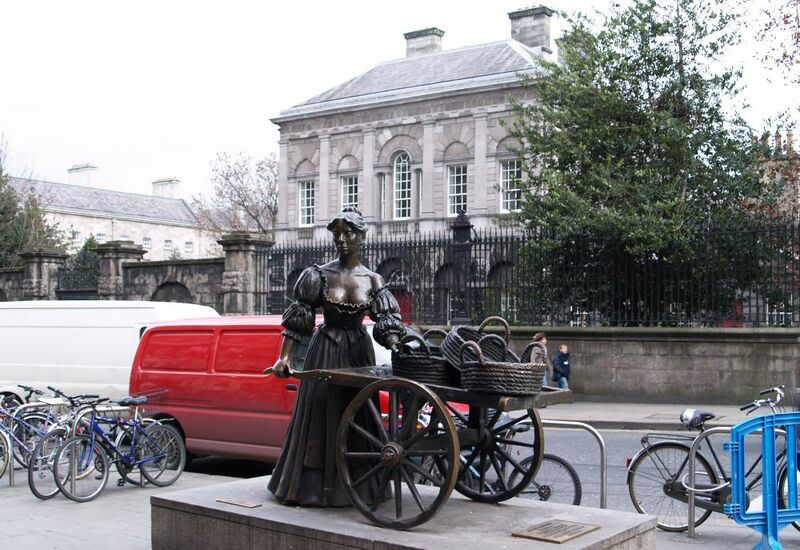 Iconic figure of Molly Malone ! 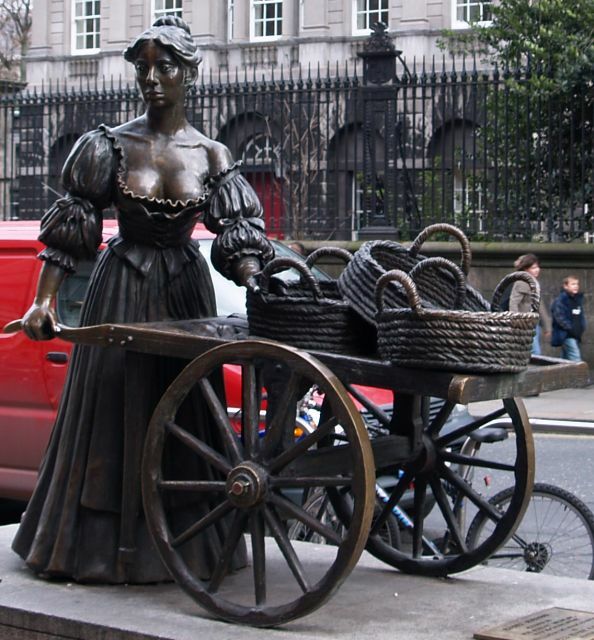 At the junction of Grafton Street and Nassau Street, Dublin, is the sculpture-statue of Molly Malone (by Jean Rynhart), irreverently known as 'the tart with the cart'. The late 17th C in Dublin and a pale attractive young lady lies in death. 'Who is it? ', 'Tis Molly Malone the fishmonger, and she is no more', 'God's judgment has come upon her', 'for as well as her trade of fishmonger she was a part-time hussy also' and so she becomes enshrined in the unofficial Dublin Anthem-song of 'Cockles and Mussels'. 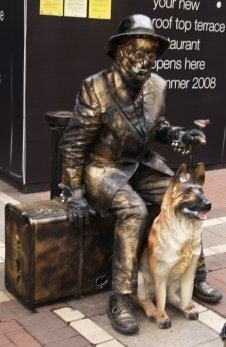 Nice statue, pity its all a myth!!!! The building in the background is the Provost's House of Trinity College, Dublin built in 1759 for Francis Andrews. 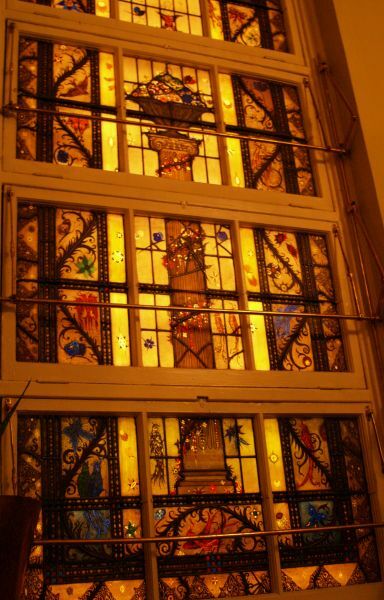 It is the only great town house in Dublin still used for its original purpose, and that's for real!!! Molly has now been moved to 5a. Three St A's of different age and uses! 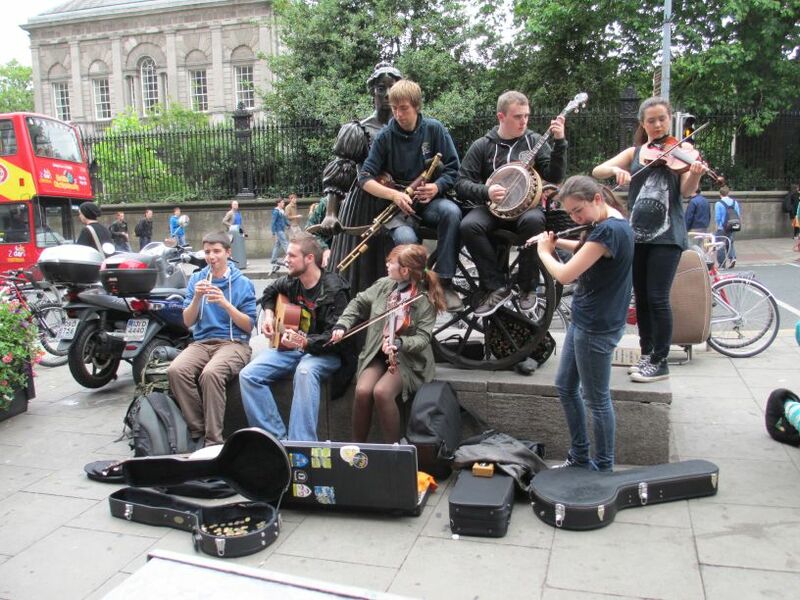 A bunch of 'traditional' musicians playing traditional music around the statue of Molly Malone here (but not now) at the bottom of Grafton Street, Dublin! 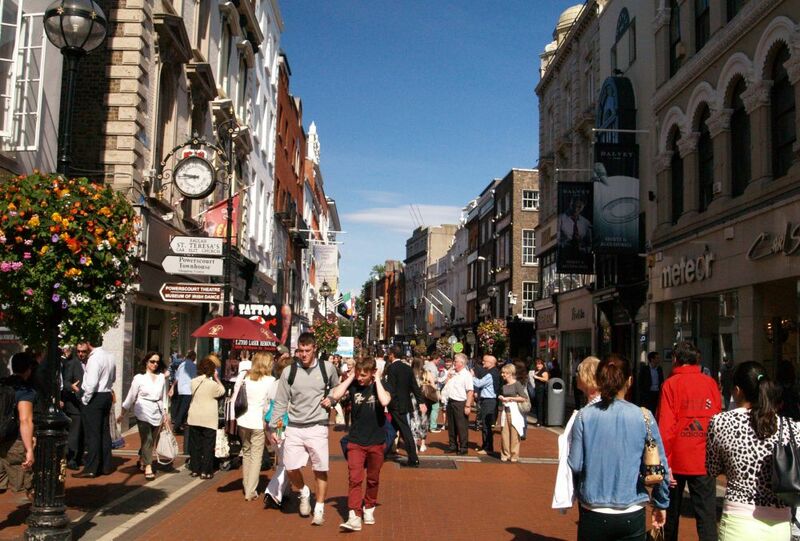 Busy sunny Grafton Street, Dublin, the best known shopping street in Dublin, neigh in all Ireland! 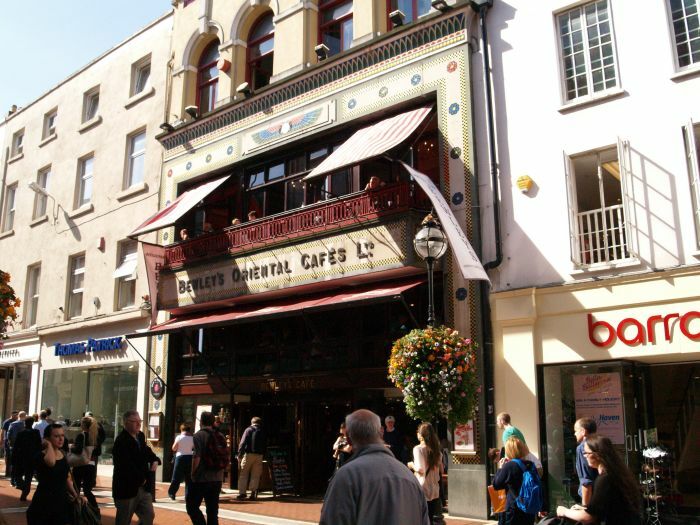 Pedestrianised Grafton Street runs up from Trinity College to St Stephen's Green is the smartest shopping street in Dublin combined with its street cafes and restaurants, high street brand shops, some quite exclusive!, always packed with tourists, shoppers and live entertainers from music to art to poetry. 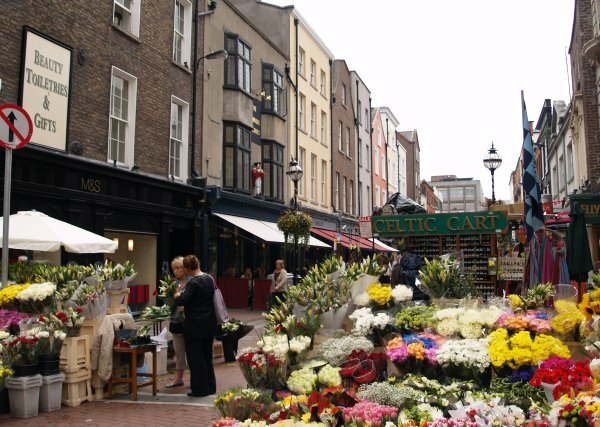 This stylish area of Dublin is fortunately pedestrianized to accommodate the energetic and talented buskers and street theatre artists. 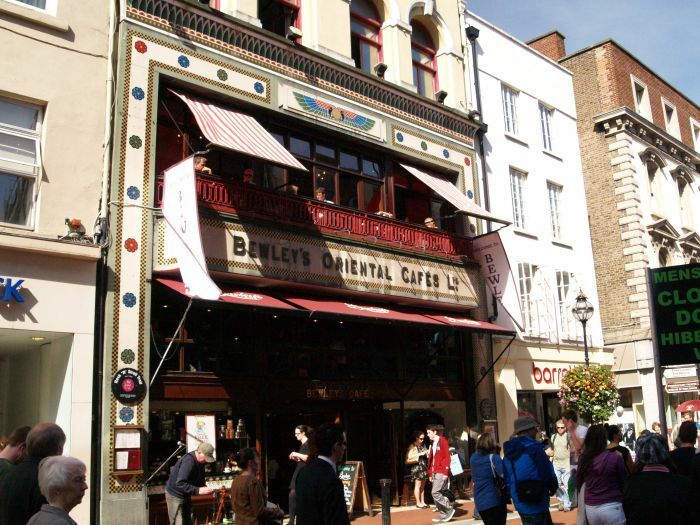 Bewley's Oriental Cafe Ltd. on Grafton Street, Dublin: Bewley’s Cafe in Grafton Street is a place where you’ll find great coffee in Ireland hand roasted in the Café, together with tasty cakes and desserts from the Café bakery, delicious soups with great Irish bread, open sandwiches, salads, pizzas and pastas, and all are freshly made to order and served in magnificent surroundings of mahogany, marble sculptures and the brightly coloured oriental stained glass. 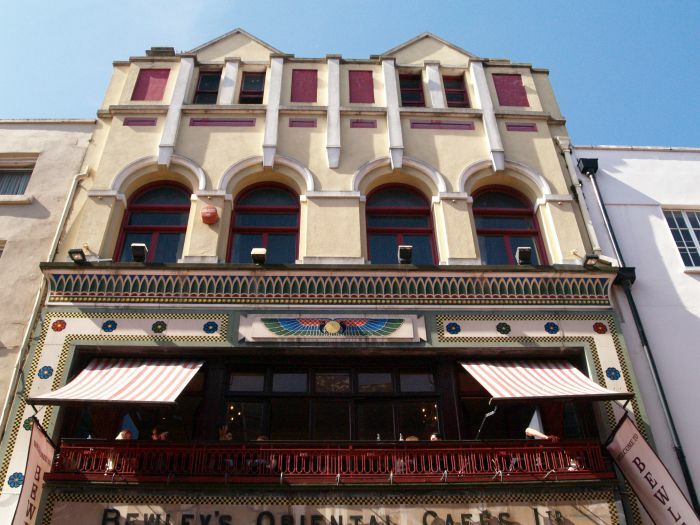 Bewley's Cafe, Grafton Street, Dublin still retains most of its original architecture and decoration. 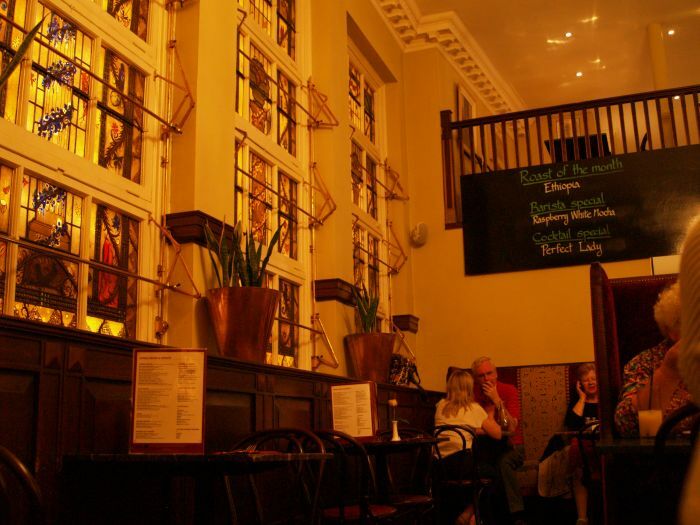 The balcony of Bewley's Cafe in Grafton Street. 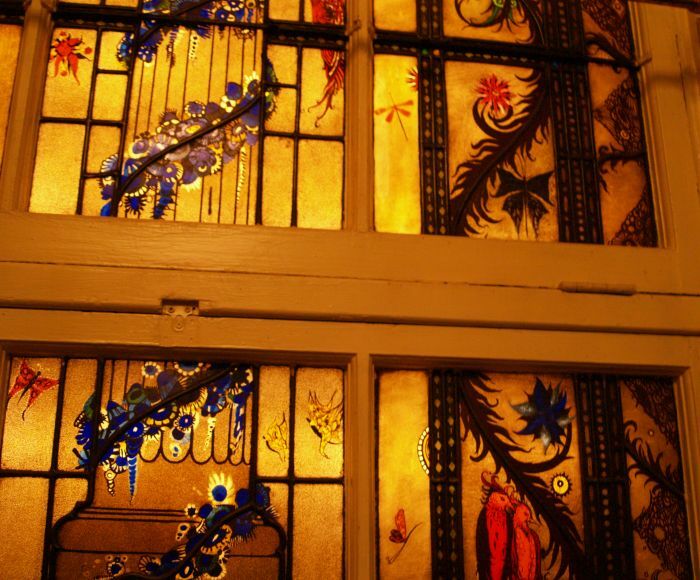 The beautifully and elaborately decorated oriental styled stained glass windows in Bewley's Cafe. 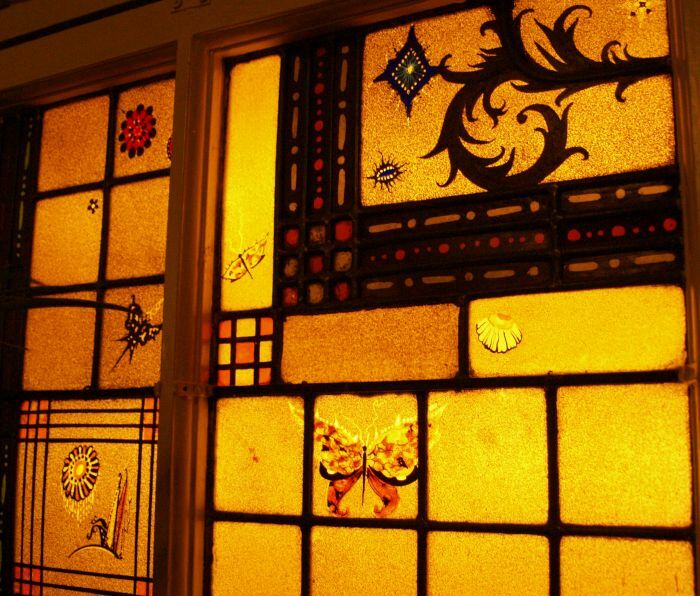 plants, birds, butterflies etc. etc.! 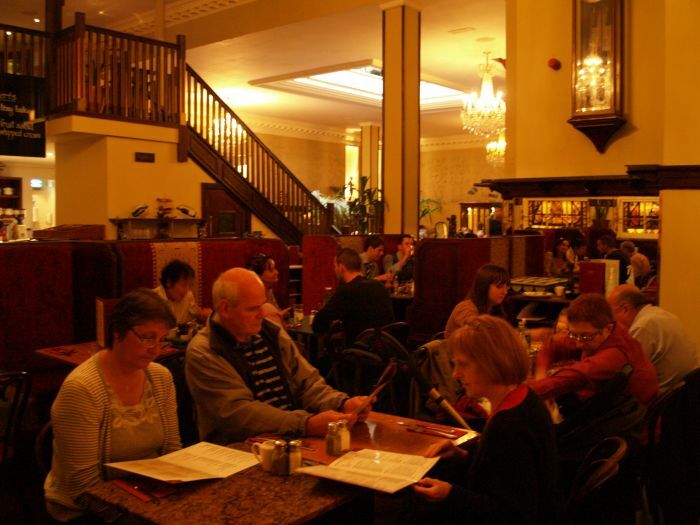 Food is a serious business in Bewley's! Busy and bustling Grafton Street, Dublin, even in the lovely Irish rain! Looking down Anne Street South off Grafton Street, Dublin. 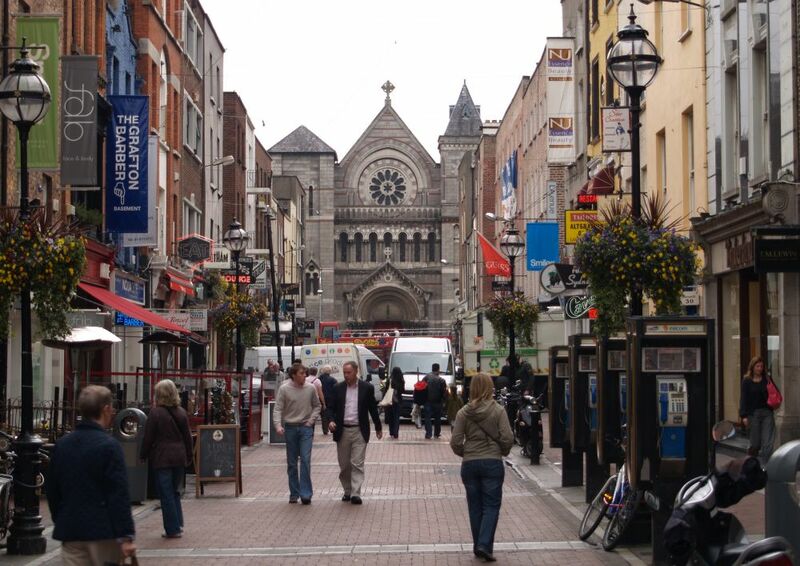 The facade of St Anne's Church, Dublin, is seen at the end. 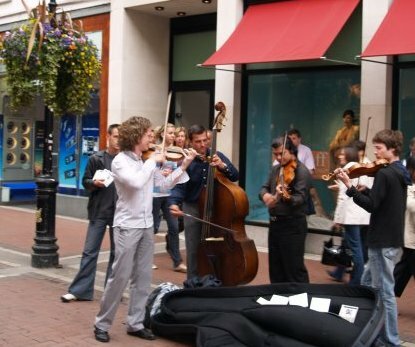 Classical street musicians and a 'street artist' in Grafton Street - now which great literary figure is portrayed here with his dog! Looking down Duke Street off Grafton Street, Dublin. 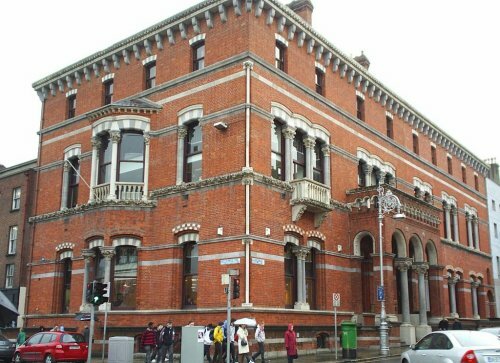 Is this the French Embassy on Nassau Street-Leinster Street South?, Dublin, a very stylish brick and stone building with a touch of Moorish architecture? 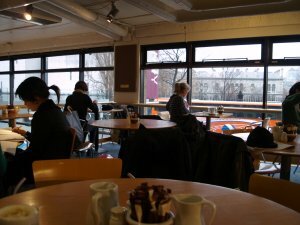 A snack at the cafe in the Kilkenny Designer Outlet store of Irish products, Dublin, Nassau Street! Part of Trinity College is in the background and students on the left enjoying a working lunch, while us tourists can just take it easy! 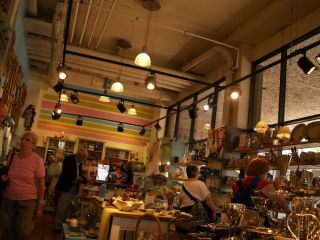 Kilkenny is Ireland's Largest Emporium for Irish Designed Products. 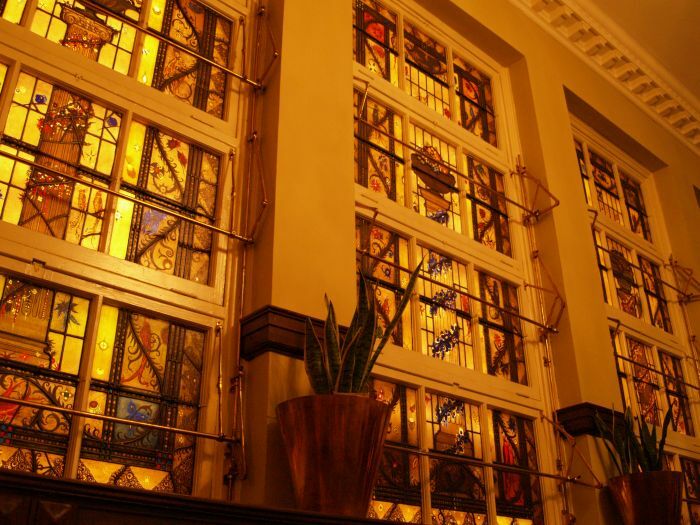 The name Kilkenny is synonymous with the finest of traditional Irish craftsmanship but contemporary tastes are more than adequately catered for. 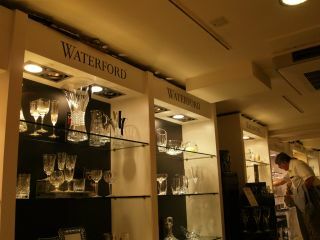 Many of Kilkenny's suppliers, such as the potters Louis Mulcahy and Stephen Pearce, have been internationally recognised as masters of their art and Irish cut and moulded glass is well known abroad, with companies like Jerpoint and Tipperary Crystal joining the long established Waterford Crystal. 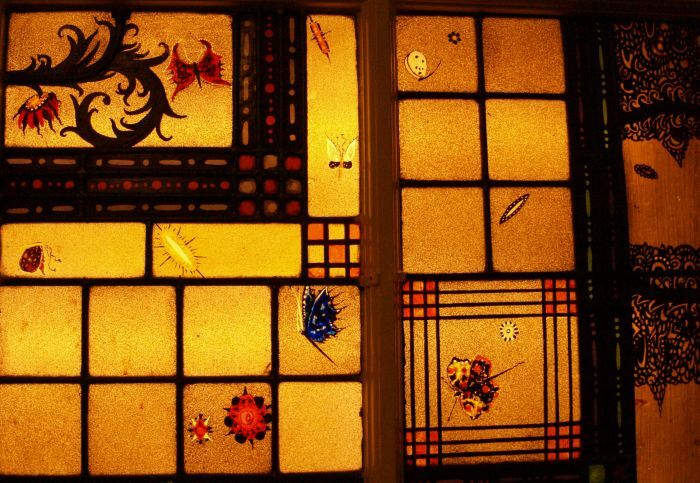 Enter place, museum, street, building, gallery, feature, anything!